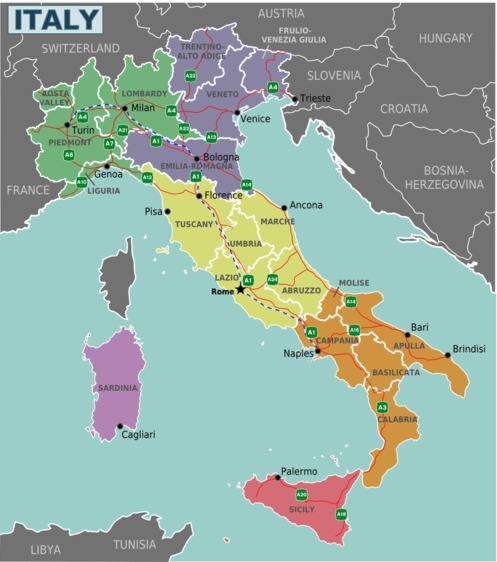 Here the Italy Regions Map and description. 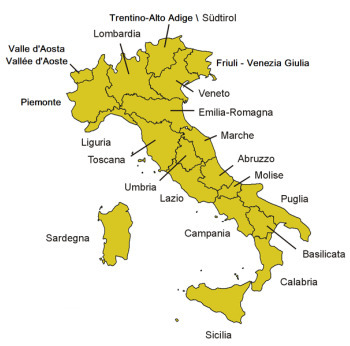 The italian regions are 20. 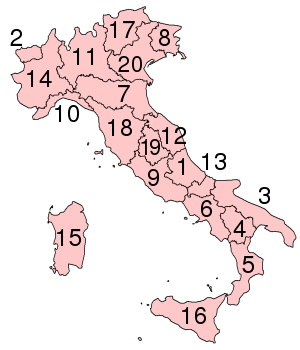 Five of these are equipped with a special statute of autonomy (Aosta Valley, Trentino-Alto Adige, Friuli-Venezia Giulia, Sicily, Sardinia) and one of them (the Trentino-Alto Adige/Südtirol), consists of two autonomous provinces, that is, with legislative powers similar to those of the Regions (Trento and Bolzano/Bozen). The Trentino-Alto Adige (Trentino-Südtirol in German) is a region in the north-east part of Italy, with capital Trento and consists of two joined regions: Alto Adige in the north, with the autonomous province of Bolzano and Trentino in the south, with the autonomous Province of Trento. It borders Austria to the north, Veneto to the south-east, Lombardy to south and west and Switzerland to the west. • Basilicata, Calabria, Sicilia, Sardegna (Sardinia). Italy is a Country that keep the regional traditions, especially in less famous towns and villages. Countless are the places full of history, art, folkloristic and gastronomic traditions where a visit could reserve an occasion for reflection or just simply pleasure.